The heterogeneous clinical phenotypes of chronic obstructive pulmonary disease (COPD) challenge successful drug development. To identify COPD subgroups beyond clinical phenotypes, we interrogated blood immune cell profiles and ex-vivo responses of current and former smokers, with or without COPD, in the longitudinal COPD Genetic Epidemiology study (COPDGene) cohort. CD4+ and CD8+ T cells and monocytes were profiled by flow cytometry. Microarray analysis was performed on the RNA from the aforementioned isolated cells. T-cell directed whole blood ex-vivo stimulation was used to assess functional responses. Blood CD4+ T-cell transcript analysis distinguished patients with COPD from control smokers and also enriched for a subset of patients with COPD that had a history of exacerbations of the disease. Analogous analyses of CD8+ T cells and monocytes failed to discriminate patients with COPD from the control population. Patients with COPD had a diminished cytokine response, compared to control smokers, characterized by low levels of granulocyte-monocyte colony stimulation factor (GM-CSF), interferon gamma (IFN-ɣ), interleukin one-alpha (IL-1α), tumor necrosis factor-alpha (TNF-α) and tumor necrosis factor-beta (TNF-β) secreted in response to T-cell directed ex-vivo stimulation. This cytokine response associated with baseline disease severity (forced expiratory volume in 1 second [FEV1]% predicted), rapidly declining lung function, and emphysema. Our observations indicate that COPD phenotypes can be further differentiated based on blood CD4+ T-cell profiles and resultant immune responses, suggesting a role for these cells in COPD pathophysiology. Funding Support: This work was supported by MedImmune. COPD is characterized by persistent, progressive airflow obstruction and by 2020 COPD is projected to become the 5th major disease burden and 3rd leading cause of death worldwide.1 The major risk factor for the development of COPD is cigarette smoke. Smoke-induced lung injury is associated with recruitment of inflammatory cells that mediate immune responses in the lung, excessive oxidative stress of lung structural cells, and breakdown of connective tissue leading to impaired gas exchange and elastic recoil.2-4 These manifestations are not fully reversible even after smoking cessation. The fact that most smokers do not develop COPD is a major medical enigma.5 Complicating the incomplete penetrance of smoking as a risk factor is heterogeneous disease presentation of chronic bronchitis and emphysema. Additionally, a subset of COPD patients suffer from frequent acute exacerbation of COPD (AECOPD)6-8; these patients experience higher morbidity and mortality and have a high impact on health care economic costs.5,6,9 Despite attempts to characterize COPD biomarkers,10-12 little is understood about the molecular differences of these clinical phenotypes.13,14 We hypothesized that an interrogation of isolated circulating immune cell populations and the activation characteristics of such cells in whole blood could differentiate patients with COPD from control smokers and subgroup patients with shared biological characteristics. Such approaches could provide a means to simplify clinical heterogeneity in COPD and partition patients into subgroups related to shared biology, resulting in appropriate treatment strategies for a specific patient profile. Appropriate biomarker strategies could result in improved development of pharmacological interventions for COPD. Lung biopsies or washings are the most abundant source materials for biomarker discovery. However, due to the difficulty of incorporating longitudinal assessments using such invasive procedures, we chose to assess blood cell profiling as a possible approach to subgroup patients with COPD. We examined the phenotype and transcriptomics of isolated CD4+ and CD8+ T cells and monocytes from the blood of smokers with and without COPD. Additionally, T-cell directed stimulation of whole blood, using a novel ex-vivo technology, was utilized as a means to study the functional responses of circulating T cells. This study was approved by the National Jewish Health (NJH) institutional review board and informed consent obtained from all. All participants were former or current smokers with >10 pack years enrolled in the COPD Genetic Epidemiology (COPDGene) study17 at NJH. 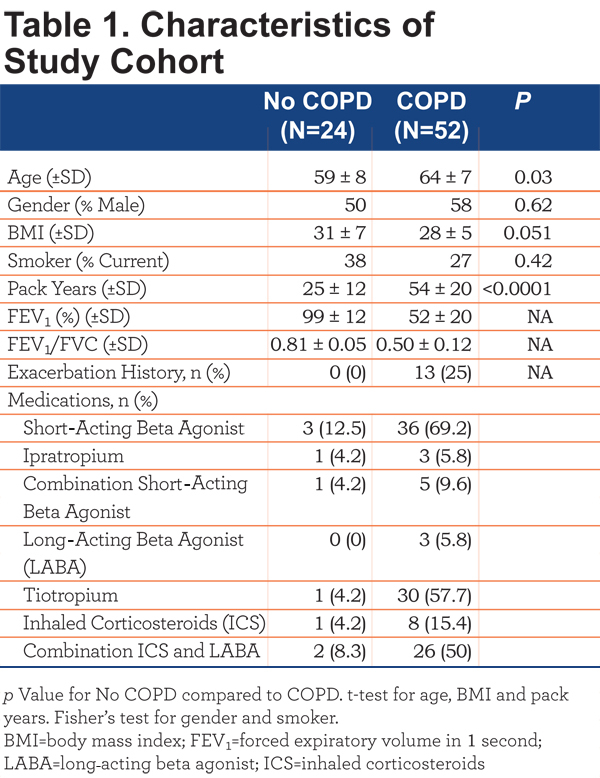 Participants were divided into COPD (FEV1/forced vital capacity [FVC]<70 post-bronchodilator; n=52) and control smokers (FEV1/FVC>70 post bronchodilator; n=24).1 Participant characteristics are outlined in Table 1. Individuals with a recent exacerbation (last dose of oral corticosteroids or antibiotics within 30 days prior to entry) were excluded. The COPD cohort was further subdivided into COPD-emphysema (EMPH) (n=23) based on low attenuation area (LAA) >5%, COPD-chronic bronchitis (CB) (n=8) based on current symptoms and COPD-emphysema and COPD-chronic bronchitis (MIXED) (n=21). Disease severity was based on Global initiative for chronic Obstructive Lung Disease (GOLD) classification criteria. Lung function decline was based on FEV1 at initial enrollment into the COPDGene study and FEV1 at the time of this study, an average follow-up period of 36 months. COPD patients with a loss of >=40mls/year FEV1 were considered rapid decliners and patients with a loss of FEV1 <40mls/year were considered slow decliners. Exacerbation history, based on the COPDGene questionnaire, was defined as patient-reported hospitalizations or emergency department treatment for lung problems in the year preceding the study visit. Therefore, the exact cause of the exacerbations is unknown. All experimental samples were collected in a single visit. After antibody staining of whole blood for T-cell and monocyte markers (see online supplement), blood was lysed, washed and cells were fixed. The fixed samples were analyzed on an LSRII flow cytometer (BD, Franklin Lakes, New Jersey). FlowJo version 9.1 (TreeStar, Ashland, Oregon) was used for analysis. One mL of whole blood was drawn into null or α-CD3/α-CD28 TruCulture® (Rules Based Medicine, Austin, Texas) tubes using standard phlebotomy techniques and incubated in a bench-top dry heat block at 37° C. After 24 hours, supernatant was collected and stored at -20° C until analysis. Supernatants were analyzed by multianalyte profiling using Rules Based Medicine’s TruCultureMAP® v.1.1. The full list of analytes is shown in the online supplement Table S1. CD8+ T cells, CD14+ monocytes and CD4+ T cells were purified from peripheral blood mononuclear cells (PBMC) as previously described.18 Isolated cells were stored in buffer RLT (Qiagen, Valencia, California) at -80° C. Additional details are available in the online supplement. Total RNA from whole blood was isolated using the PAXgene Blood RNA kit (Qiagen) and total RNA from purified cells were isolated using the RNAeasy Mini kit (Qiagen). RNA quality was assessed on Agilent 2100 Bionanlyzer (Agilent Technologies, Santa Clara, California) and RNA was processed for microarray analyses as previously described.19 Affymetrix HGU133+ arrays (Affymetrix, Santa Clara, California) were normalized using GC-RMA and all processing was conducted in R (http://www.R-project.org). Unsupervised clustering analysis and heatmap generation was conducted using QluCore Omics Explorer (Lund, Sweden). Total RNA from CD4+ T cells were analyzed by an 83 gene T Helper Cell Differentiation RT-PCR array (Qiagen) according to manufacturer’s protocol. SDS 2.4 software (ABI) was used to generate Ct values. Fold change was calculated using 2(-delta delta Ct) formula. All microarray files discussed in this manuscript have been submitted to the National Center for Biotechnology Information’s Gene Expression Omnibus (GEO). Statistical analysis was conducted using Prism (GraphPad, La Jolla, California). Two group testing was conducted using either Student’s t-test or Wilcoxon-Mann-Whitney u-test (2 group 2 tailed) where indicated, and group testing equivalence of means was conducted using a one-way analysis of variance (ANOVA) with fixed effects. All p<0.05 were considered significant. Flow cytometry immunophenotyping was performed on CD4+ and CD8+ T cells and monocytes in the whole blood. Of the cell types examined we only found differences in the CD4+ T cells (Figure 1 A-C). Our analyses revealed a lower proportion and number of CD4+ T cells in patients with COPD compared to control smokers, though statistical significance was only observed comparing numbers of CD4+ T cells (Figure 1A) (p=0.0006). 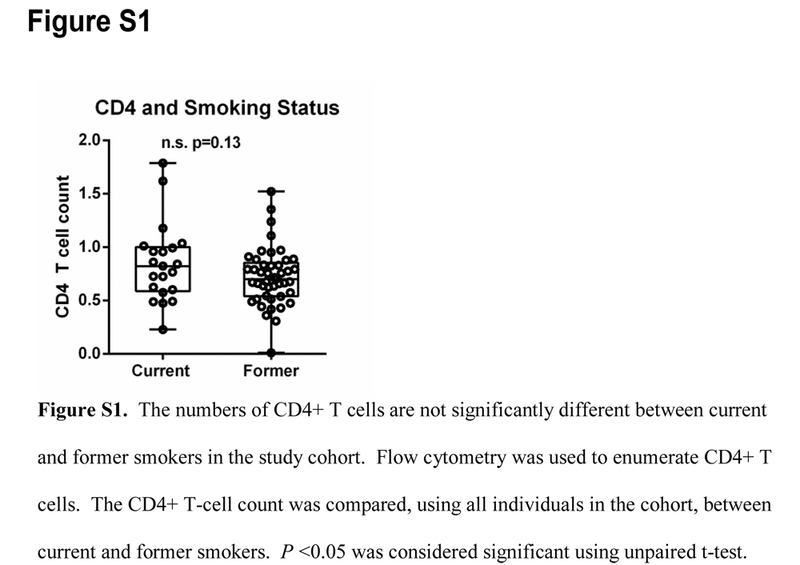 There was no difference in CD4+ T-cell numbers between current and former smokers in our cohort; strongly suggesting that our observation of lower CD4+ T cells in COPD patients is not due to smoking status (online supplement Figure S1). Analysis of discrete CD4+ T-cell subsets indicated significantly lower numbers (Figure 1D) and proportions (Figure 1E.) of CD4+ Th1 T cells (CXCR3+) in patients with COPD compared to control smokers (p=0.0001 and p=0.01, respectively). CXCR3 positivity was used to describe Th1 cells and expression of CCR6 was not assessed. Additionally, CD4+ central memory, CD4+ effector memory and CD4+ CD146+ T cells, an IL-17A secreting subset,20 were all significantly lower in patients with COPD compared to control smokers (Figure 1F-H) (p=0.0006, p=0.009, and p=0.04, respectively). Similar flow cytometric analysis was performed on CD8+ T-cell subsets. We found no differences between COPD and control CD8+ T-cell subsets. Moreover, no differences were observed among monocyte subsets between COPD and controls. Thus, of the cell types examined, CD4+ T cells were the only cell type with observed alterations compared to controls. To understand whether gene expression analysis could identify molecular subgroups of COPD, RNA from CD4+ T cells, isolated from peripheral blood (95.2±3.12 and 94.48±2.81 percent purity, mean ± SD, control smokers and COPD, respectively) was used for microarray studies. After microarray data normalization, transcripts were filtered with a stringent criteria based on log2 mean intensity >5 and coefficient of variation (CV)>20% to select only the most variant genes. The 212 transcripts that remained after filtering were analyzed, patients with COPD compared to control smokers, using a t-test restricted to false discovery rate (FDR; q-value) <0.05. This analysis resulted in 44 transcripts (42 upregulated and 2 down regulated) with fold changes >1.5, representing 43 unique genes (q<0.05). Unsupervised hierarchical clustering of the 44 differentially expressed transcripts separated participants into 2 major groups, based on data visualization, with a majority of the controls (75%) in Group I (Figure 2A, left, yellow) and the majority of the COPD patients (75%) in Group II (Figure 2A, right, blue), (Fisher’s exact test p<0.0001). The COPD patients in Group II were subsequently clustered utilizing the 44 transcripts that differentiated COPD from controls. This analysis revealed 2 major subgroups, based on data-visualization, of COPD patients – COPD-A (Figure 2B, left) and COPD-B (Figure 2B, right). 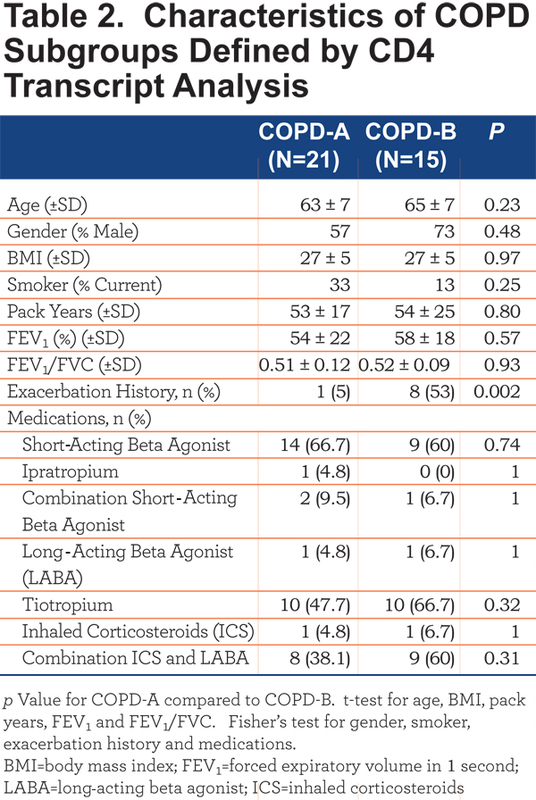 These subgroups did not differ on clinical characteristics or medication usage except that the subgroup COPD-B had more patients with COPD exacerbations (exacerbation history), 53% compared to 5% in the COPD-A subgroup (Table 2) (Figure 2B, exacerbation top: blue = exacerbation history) (Fisher’s exact test p=0.002). The CD4+ T-cell RNA was further investigated using a T Helper Cell Differentiation RT-PCR 84 gene array. The CD4+ T cells of COPD-A (Figure 2B) patients did not differ greatly from control smoker CD4+ T cells (Table 3). However, the blood CD4+ T cells from the COPD-B (Figure 2B) patients (exacerbation enriched) differed from controls in the expression of 18 genes, 13 with up-regulation and 5 with down-regulation (all p<0.05;Table 3). 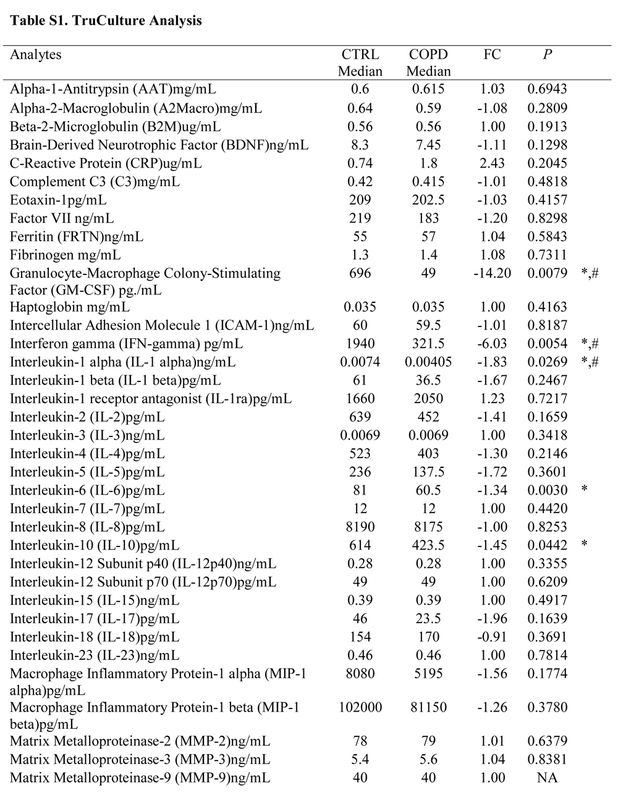 Interestingly, COPD-B individuals (exacerbation enriched) had higher expression of 8 Th1-related genes, indicating a predominance of Th1 gene involvement in this subgroup (p=0.04, Fisher’s exact test, Table 3). In contrast to the results of CD4+ T-cell mRNA; there were no significant differentially- expressed transcripts between COPD and controls in whole blood, CD8+ T cells and CD14+ monocytes. Thus, of the cell types examined, only CD4+ T-cell transcripts separated patients with COPD from control smokers and differentiated subsets of patients with COPD. The flow cytometry and microarray results identified differences in CD4+ T cells in patients with COPD compared to control smokers (Figures 1 & 2). These data lead us to question whether there were also functional changes in the T cells of patients with COPD. To address this question, we examined the cytokine response of whole blood, from patients with COPD and control smokers, to T-cell stimulation using α-CD3/α-CD28. We utilized the TruCulture® ex-vivo system for activation of whole blood T cells with minimal experimental manipulation. 21 Supernatants from α-CD3/α-CD28 stimulated whole blood (TruCulture® system) from patients with COPD and control smokers were analyzed by TruCulture MAPv1, a 47 analyte multiplexed immunoassay (online supplement Table S1). Of the 47 analytes, 5 were present at significantly lower (p<0.05 and fold change at least 1.5) amounts, after stimulation, in the supernatant from COPD compared to controls, GM-CSF, IFN-ɣ, IL-1α, TNF-α, and TNF-β (Figure 3A). As a means to probe the collective significance of these individual cytokines, we created an ex-vivo response score, the T-cell stimulation score (TSS), a normalized composite of GM-CSF, IFN- ɣ, IL-1α, TNF-α, and TNF-β concentrations. Each individual cytokine concentration was normalized to the highest concentration such that the highest value possible is 1. Each of the cytokine normalized values across an individual participant was summated to create the TSS. The TSS was lower in patients with COPD compared to control smokers (p<0.05) (Figure 3B) and, interestingly, correlated with FEV1% predicted in patients with COPD (p<0.05) (Figure 3C). 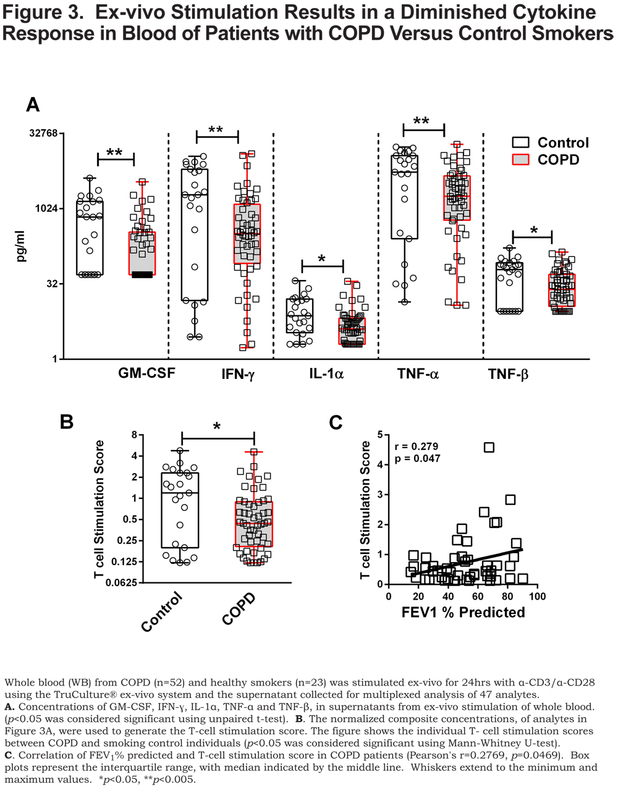 Of the individual cytokines that comprise the TSS, the levels of GM-CSF, IFN- ɣ and TNF-α correlated to FEV1% in COPD (online supplement Table 2). The TSS was lower in patients with COPD that have emphysema (p<0.05) (Figure 4A), more severe disease, GOLD stage III and GOLD stage IV (Figure 4B) (both, p<0.005), and those with rapidly declining lung function (p<0.005) Figure 4C). In patients with COPD with or without an exacerbation history, the TSS was lower, compared to control smokers (Figure 4D) (both, p<0.05). 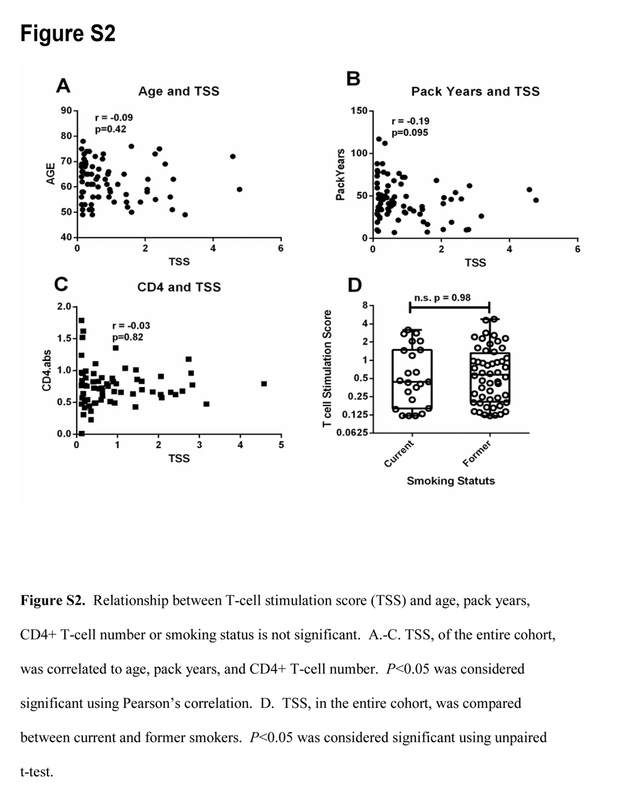 Importantly, the TSS did not correlate with age, pack years, or CD4+ T-cell numbers and there was no difference in the TSS between current and former smokers in our cohort (online supplement Figure S2). There was also no difference in the TSS among COPD individuals with regards to current medication status (online supplement Figure S3). These data indicate that the disparate response to T-cell stimulation was biologically driven as opposed to differences in demographics, CD4+ T-cell number, smoking status and treatment status. Whereas the mechanisms controlling the disparate response of T cells from COPD patients relative to controls, to ex-vivo stimulation of T cells, remains unanswered, it is important to note that this observation is a result of α-CD3/α-CD28 stimulation as there was an induction of these cytokine responses above the baseline unstimulated (null) blood sample (stimulation index) (online supplement Table S3). The development of effective medicines for COPD continues to be a challenge partly due to disease heterogeneity and lack of disease biomarkers.22 The development of blood (an easily accessible tissue) biomarkers would enhance the understanding of COPD pathophysiology and facilitate patient subdivision. T cells in COPD, primarily CD8+ and to a lesser extent CD4+, have been well-characterized as a part of the cellular infiltrates in the airways and lungs of patients with COPD.23-25 In this study, similar to others, 26,27 we find that patients with COPD have a decrease in blood CD4+ T cells compared to control smokers. We also report a decrease in the CD4+ central memory, CD4+ effector memory and CD4+CD146+ T-cell subsets compared to control smokers. Previous reports on the phenotypic profiles of peripheral blood T-cell subsets in patients with COPD have been inconsistent.26-33 Several studies have found no significant differences in CD4+ T-cell subsets in COPD compared to either control smokers, non-smoker controls or a combination of both populations.30,31. For consistency of interpretation, our control smoker population consisted of long term smokers without obstruction. Interestingly, one of the studies that did not show a difference in CD4+ T cells in patients with COPD at baseline, described a decrease in CD4+ T cells following experimental rhinovirus infection – a model of COPD exacerbation. 30 Our observation of decreased CD4+ T cells in patients with COPD, compared to control smokers, was not related to an acute exacerbation as our cohort was not studied around the time of an exacerbation. 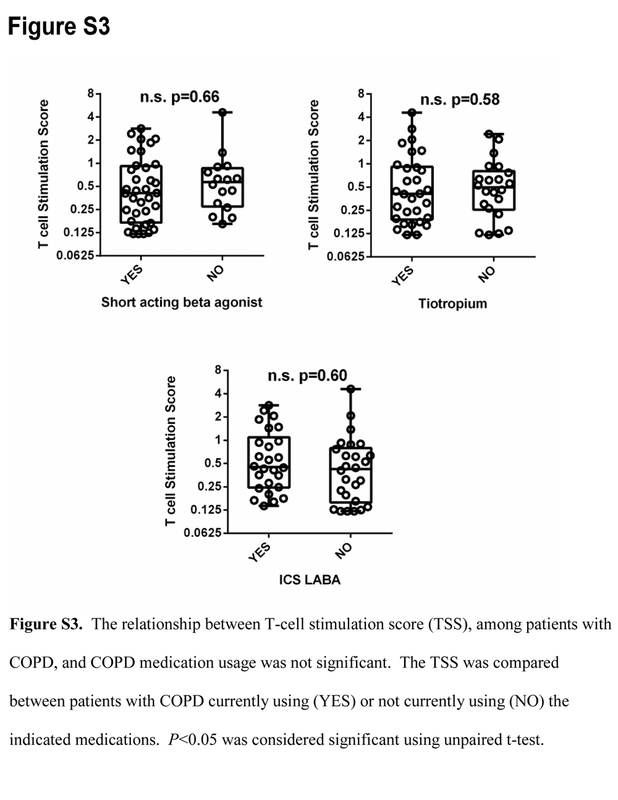 T-cell dysregulation in our cohort of patients with COPD compared to the control smokers. Importantly, our results were irrespective of whether individuals were current or former smokers. Previous gene expression studies in COPD have identified transcription changes in the lung and more recently PBMCs.39-41 We show for the first time that CD4+ T-cell transcriptomic patterns are distinct from control smokers. Additionally, the CD4+ T-cell transcriptomics revealed distinct subgroups including one enriched for patients with COPD that have an exacerbation history. Moreover, this subgroup was defined by a predominance of Th1-related genes, compared to control smokers, as assessed by the RT-PCR array data. These results are interesting, as Th1-driven adaptive immunity has been reported in the pathophysiology of COPD.32,42 Taking into account our data, we suggest that CD4+ T-cell profiling can identify subgroups of COPD patients that share a common biology that relate to and/or drive disease manifestations. Thus, functional aberrations in CD4+ Th1 cells in a subgroup of patients with COPD, may accentuate exacerbation susceptibility. 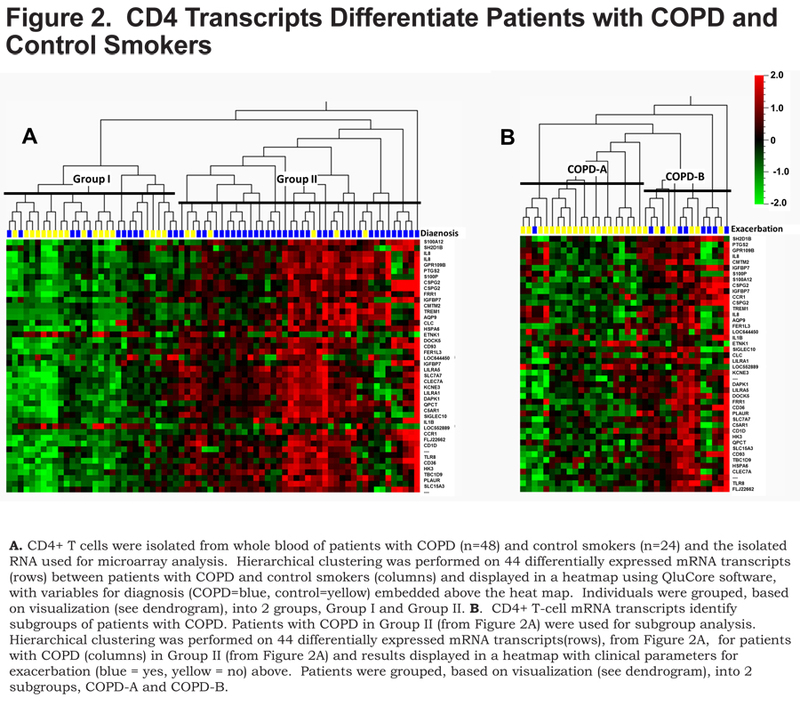 Comparable mRNA transcript analyses of isolated CD8+ T cells and CD14+ monocytes were unable to differentiate patients with COPD from control smokers. This result was surprising as CD8+ T cells and monocytes are known to be contributors in the inflammatory response to cigarette smoke.7,43 However, the data demonstrate that COPD-associated alterations in blood CD4+ T cells are the most easily discoverable. 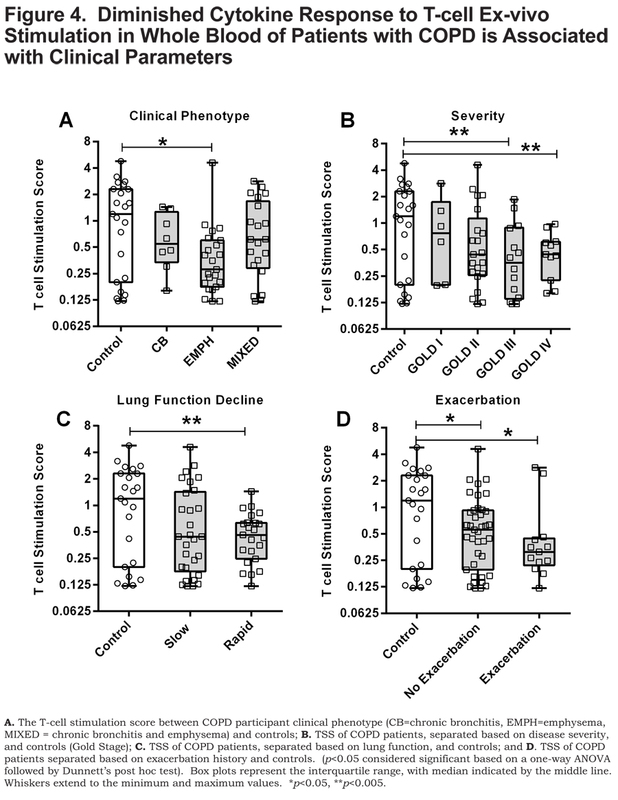 This result suggests that CD4+ T cells may be chief drivers of the dysregulation of immune cell functions in COPD. We hypothesized that the response to T-cell directed stimulation could provide a means to mechanistically differentiate patients with COPD. Consistent with this hypothesis, patients with COPD, compared to control smokers, were characterized by a diminished functional cytokine response (lower TSS) to T-cell polyclonal activation (α-CD3/α-CD28). Furthermore, the ex-vivo cytokine response (TSS) correlated with severity (FEV1%) of COPD and associated with rapid decline of lung function (loss of FEV1) and COPD exacerbation. The responses were independent of smoking status or CD4+ T-cell number indicating in-vivo dysregulation of T cells as a disease-related phenomenon in COPD. 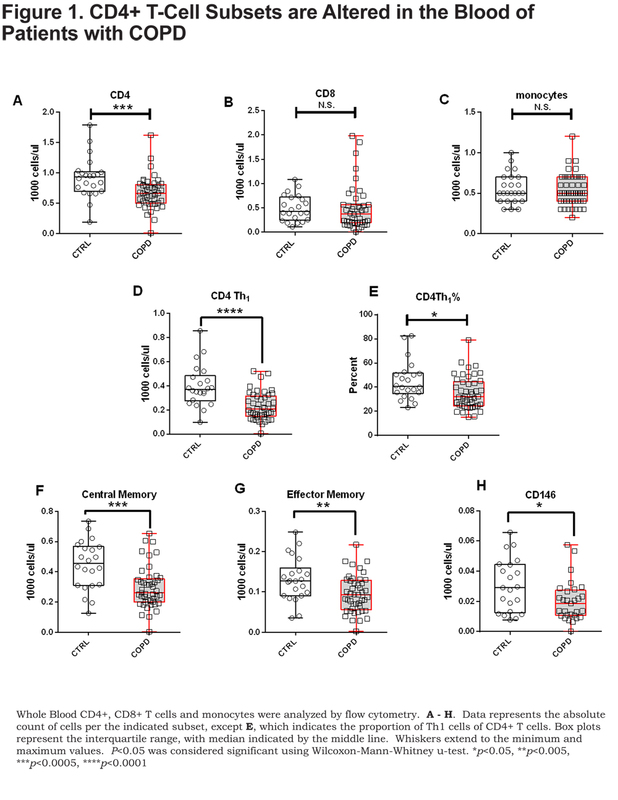 T cells can modulate the innate immune response and this adaptive modulation is necessary to temper early innate responses.44,45 In COPD, the ability to mount this adaptive response is impaired in in-vitro-differentiated CD4+ Th1 T cells.46 Our study does not examine adaptive cell regulation of innate immune responses. However, this may, in part, explain the diminished cytokine response to T-cell ex-vivo stimulation. Our experiments utilized global T-cell stimulus (α-CD3/α-CD28) and as such it cannot be determined whether CD4+ T cells, rather than CD8+ T cells, drive these aberrant cytokine responses. However, based on our observations of phenotypic and gene expression differences only in the CD4+ T-cell subset, it would be tempting to suggest that the diminished cytokine responses are at least partially attributed to CD4+ T cells. Overall, as suggested by our data, it is possible that altered T-cell responses may contribute to functional changes in the innate immune system and therefore modify early response to infectious agents. In conclusion, our data suggests, that in patients with COPD, in-vivo activation of blood CD4+ T cells result in functional variation of immune responses that can provide biological segregation of COPD patients. Our study represents novel preliminary findings and provides impetus for follow-up studies in a larger independent validation cohort. Nonetheless, we demonstrate the utility of blood immune cell profiling and responses in biomarker discovery applications for COPD. An understanding of individual immune cell aberrations in COPD can lead to stratification of patients whose disease is directed by shared biology and therefore assist in the simplification of drug development in this heterogeneous disease population. The authors thank Christina Schnell, Jennifer Underwood and the nurses of the Clinical Translational Research Center at National Jewish Health for patient recruitment, administering questionnaires and blood collections. M. Roberts declares an employee relationship with MedImmune. B. Higgs, P. Brohawn, F. Pilataxi, X. Guo, M. Kuziora, and W. White declare an employee relationship with MedImmune and ownership of AstraZeneca stock. R. Bowler declares no competing interests. The authors alone are responsible for the content and writing of the manuscript. Flow Cytometry. Whole blood from COPD patients and control individuals were used for flow cytometry assays. Complete blood counts (CBC), in combination with flow cytometric analyses, were used to enumerate the numbers of T cells, T-cell subsets and monocytes. Whole blood was aliquoted and 200μLs used for each flow cytometry assay. The following anti-human antibodies were used for whole blood staining of T-cell subsets; anti-CD3 AF 700 (eBiosciences, San Diego, CA), anti-CD4 PE-Cy5 (eBiosciences), anti-CD8 PE-Cy7 (eBiosciences), anti-CD45RA Qdot605 (Life Technologies, Carlsbad, CA), anti-CCR7 BV421 (BioLegend, San Diego, CA), anti-CCR5 A488 (BioLegend), anti-CD146 PE (BD Biosciences, San Jose, CA), and anti-CD19 APCeFluor780 (eBiosciences). The following anti-human antibodies were used for whole blood staining of monocyte subsets; anti-CD14 FITC (eBiosciences), anti-CD16 PE-Cy7 (eBiosciences), anti-CD45 APCeFluor780 (eBiosciences), anti-HLA-DR A700 (eBiosciences), anti-CCR2 PE-Cy5 (Biolegend), anti-CD56 PerCpCy5.5 (BioLegend). After antibody staining, BDFACS lyse (BDBiosciences) was used to remove red blood cells. Cells were washed and fixed with IC fixation buffer (eBiosciences). The fixed samples were analyzed on a 5-laser LSRII flow cytometer (BD, Franklin Lakes, NJ). FlowJo version 9.1 (TreeStar, Ashland, OR) was used for analysis of flow cytometry data. Cellular Isolations. Peripheral blood mononuclear cells (PBMC) were isolated from whole blood using Ficoll-Paque (GE Healthcare, Piscataway, New Jersey) density gradient centrifugation. Positive selection was used to purify cells as it results in improved purity over negative selection, and there are no significant consistent differences in expression data between the two methods.1 Briefly, CD8+ T cells were isolated from PBMC samples by magnetic selection using CD8 microbeads (all microbeads for cellular isolations from Miltenyi Biotech). The CD8+ depleted PBMC fraction was used to isolate CD14+ cells using CD14 microbeads. The remaining PBMC sample (CD8 and CD14 depleted), was used to isolate CD4+ T cells using CD4 microbeads. Cell purity was assessed by flow cytometry. Isolated cell subset pellets were stored in buffer RLT (Qiagen, Valencia, California) plus 1% 2-mercaptoethanol (Sigma Aldrich) at -800C. 1.Lyons PA, Koukoulaki M, Hatton A, Doggett K, Woffendin HB, Chaudhry AN, Smith KG. Microarray analysis of human leucocyte subsets: The advantages of positive selection and rapid purification. BMC Genomics. 2007;8:64. 18.Lyons PA, Koukoulaki M, Hatton A, et al. Microarray analysis of human leucocyte subsets: the advantages of positive selection and rapid purification. BMC Genomics. 2007;8:64.